Ng Eng Teng, the grandfather of Singapore’s sculpture was known for his figurative sculptures and his versality. Breaking from his usual mould, he also paints, having learnt from firstgeneration masters such as Georgette Chen and Liu Kang. 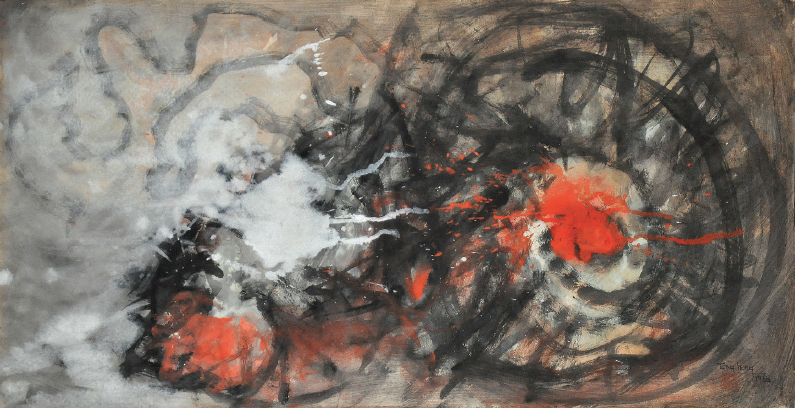 In the fashion of a Chinese painting, Eng Teng showcases his niche for abstract using ink and colour on paper. “The human figure remains Eng Teng’s principal source of inspiration and, no matter how abstract, his works, from the earliest, tentative explorations to these mature, masterful creations, always retain some link with figuration. They can be classed into a number of categories, most of which are familiar to viewers who have followed his career because he tenaciously explores familiar themes, particularly the female figure, which his fertile imagination transforms into the most unexpected and surprising images.” – Constance Sheares, Bodies Transformed: Ng Eng Teng in the Nineties.